Keep your favorite recipes organized with your very own Recipe Card Dividers. 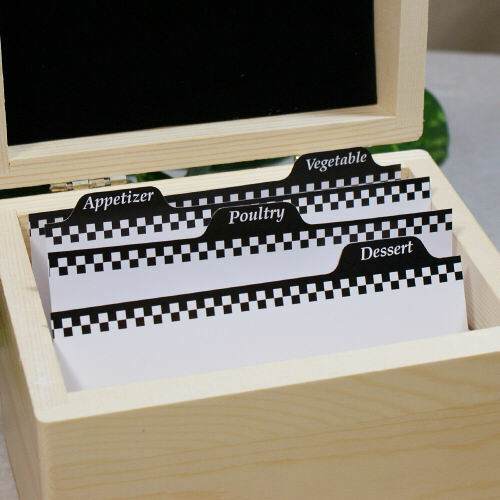 Recipe Card Dividers fit any 4x6 Recipe Card Box and are extremely helpful when you are looking for certain meals. A single order includes one bag of 24, 4" x 6" Recipe Card Dividers. You may also like... our 4" x 6" Recipe Box And Cards. These are very nice divider cards and fit perfectly in the engraved Happily Ever After Ricipe Box.. They are cute, but would be nice if the staggered layout was in alpha order. Shop GiftsForYouNow.com for all your Personalized Kitchenware needs. You will find we have a wonderful selection of Personalized Recipe Card Boxes along with our unique Personalized Aprons. Each make wonderful Personalized Housewarming Gift ideas.